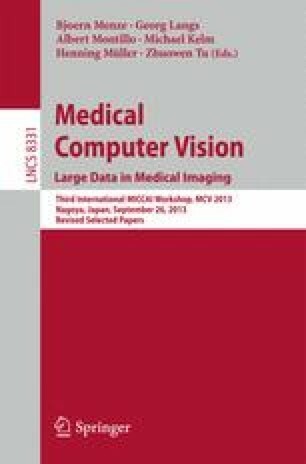 In this paper, a novel 3D retrieval model to retrieve medical volumes using 2D images as input is proposed. The main idea consists of applying a multi–scale detection of saliency of image regions. Then, the 3D volumes with the regions for each of the scales are associated with a set of projections onto the three canonical planes. The 3D shape is indirectly represented by a 2D–shape descriptor so that the 3D–shape matching is transformed into measuring similarity between 2D–shapes. The shape descriptor is defined by the set of the \(k\) largest singular values of the 2D images and Euclidean distance between the vector descriptors is used as a similarity measure. The preliminary results obtained on a simple database show promising performance with a mean average precision (MAP) of 0.82 and could allow using the approach as part of a retrieval system in clinical routine. The research leading to these results has received funding from the European Union’s Seventh Framework Programme under grant agreement 257528 (KHRESMOI) and 258191 (PROMISE). The authors would like to thanks also the project TEC2012-39095-C03-02, of the Spanish Ministry of Economy and Competitiveness.